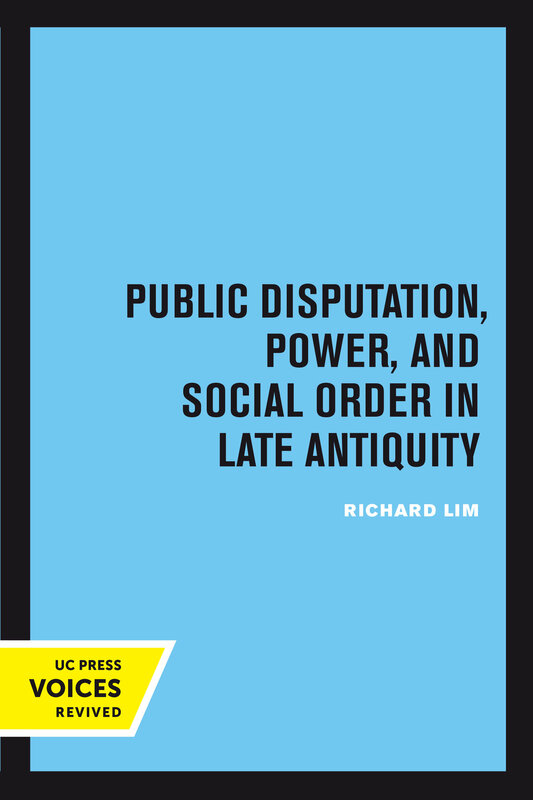 Richard Lim explores the importance of verbal disputation in Late Antiquity, offering a rich socio-historical and cultural examination of the philosophical and theological controversies. He shows how public disputation changed with the advent of Christianity from a means of discovering truth and self-identification to a form of social competition and "winning over" an opponent. He demonstrates how the reception and practice of public debate, like other forms of competition in Late Antiquity, were closely tied to underlying notions of authority, community and social order. This title is part of UC Press's Voices Revived program, which commemorates University of California Press’s mission to seek out and cultivate the brightest minds and give them voice, reach, and impact. Drawing on a backlist dating to 1893, Voices Revived makes high-quality, peer-reviewed scholarship accessible once again using print-on-demand technology. This title was originally published in 1995. Richard Lim is a professor of the ancient Mediterranean and Near East, Greece and Rome, and late antiquity. His scholarly research focuses on the history and religions of late antiquity in the Mediterranean and Near Eastern worlds, especially the later Roman Empire.